Bento Days #1 - Onigiri of course! After our discussions about the value of money earlier this month I asked DinoBoy if he would like to start bringing food to school for recess. He thought (and I mean really think... like making-big-decision kinda thinking) for a minute, said "Ee-yup, okay!" and immediately added "may~be... not every day lah, maybe some of the days only." Do you feel the high and sudden low of feelings I am experiencing in that 10 seconds? Since this will be the FIRST TIME I am making bento and will be preparing them in the morning I wanted something that is easy to prepare. I scoured online and zero in to onigiri as it looks easy enough to prepare within an hour plus we have some sushi rice in the cupboard. 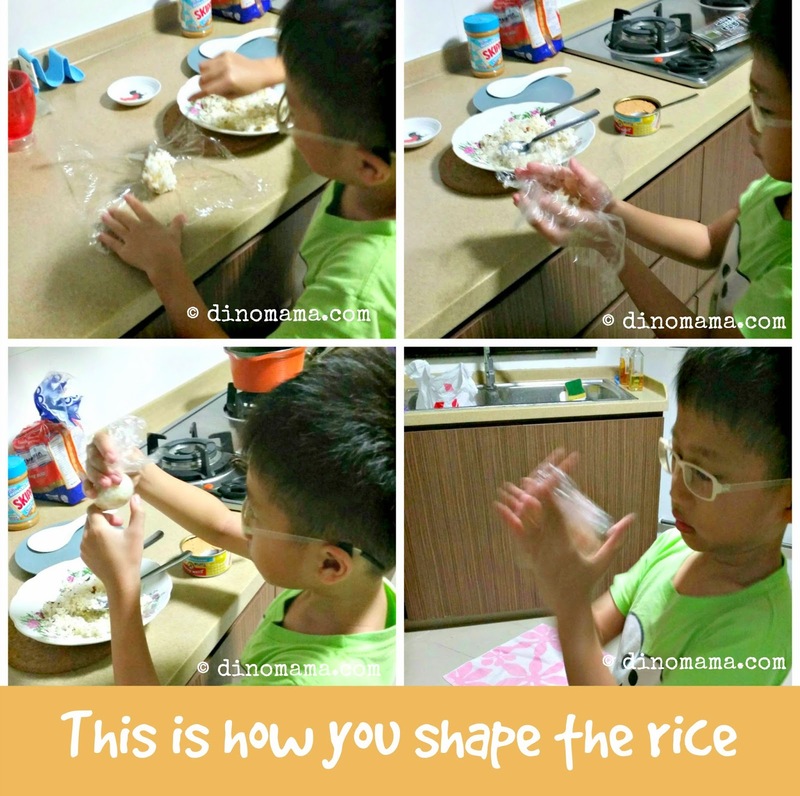 I told DinoBoy about it and he's very excited, saying that he wanted to help with the making of onigiri. We went to the supermarket to hunt for things to make it, grabbed 2 packets of sushi rice seasoning and a can of mayo tuna. The next morning I work up 15mins earlier, after I washed up I put the rice to cook and sat down to enjoy my morning 3-in-1 coffee while crocheting my current project. 30mins later our new rice cooker gave out a nice cute melody to let me know that the rice is done. I let it sits for 5 mins before fluffing the rice and bring the pot out to let the rice cool off a little bit. Woke the little fella up, get him to wash up while I prepare a piece of cling wrap, seaweed, scissors, some spoons, plate, lunch boxes and opened the can of mayo tuna. He chose the chicken rice seasoning and I mixed that into the rice,the amount is according to your liking/preference. To put the filling, simply indent a hole with your thumb, put in the filling, close up hole with the rice (or you can add in more rice) and viola~ you are done! I still have to perfect my skill in this because the mayo tuna spill out after I tried pressing the rice together to make them stick and shape it. You can see who is having a greater fun here right? He started off with only a strip of seaweed then he got all creative. In the photo above he cut the ears, eyes & whiskers for the mouse and start decorating it. He made panda (the top onigiri) and Mr Big Beard with a pipe (the bottom onigiri) for me. 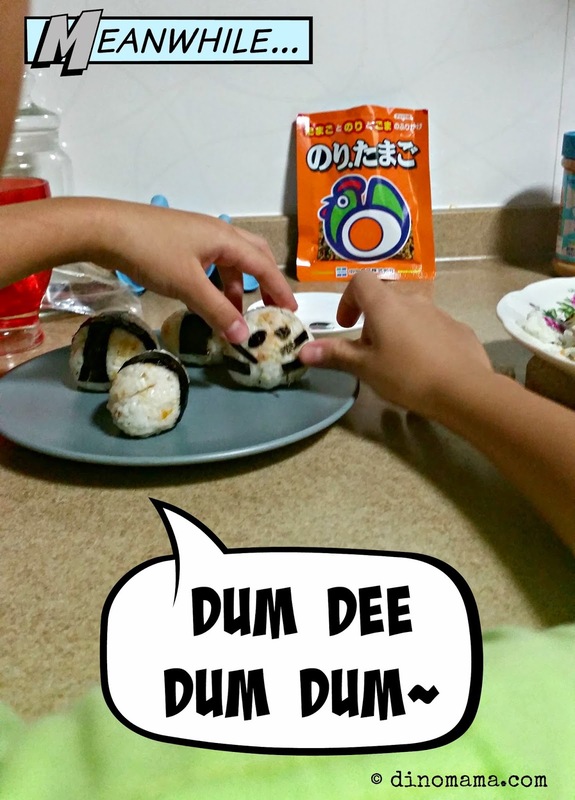 After that, he got tired and "any-o-how" decorate the rest of the rice balls. At 6.50am the onigri are packed in the respective lunch boxes, about one and a half hour from the minute I put the rice to cook. 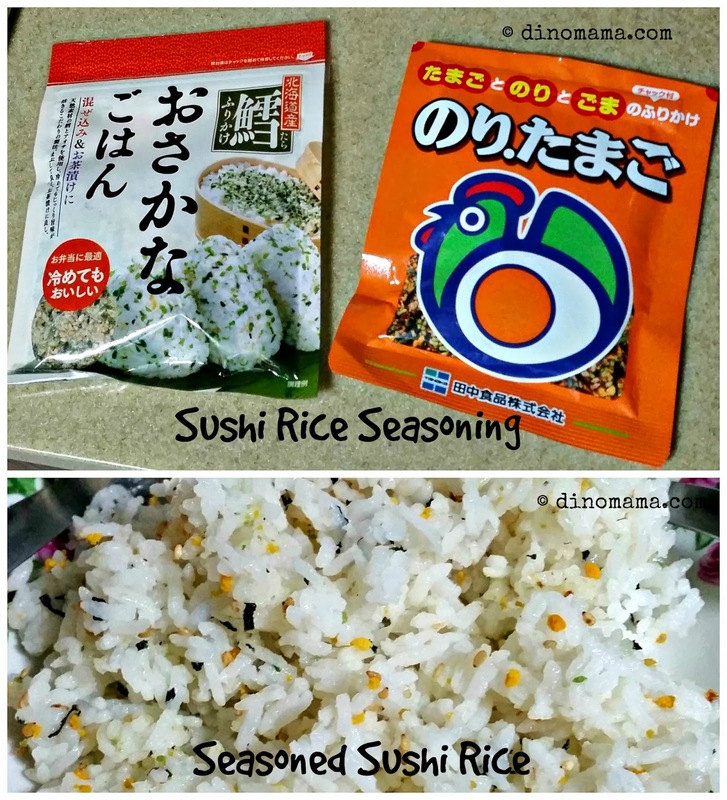 It's an easy and relaxing preparation process with a 30 mins of waiting time while the rice cooks, plus I have a little help to cut the seaweed and decorate the rice balls. I'm thinking we will be doing more of this in near future. 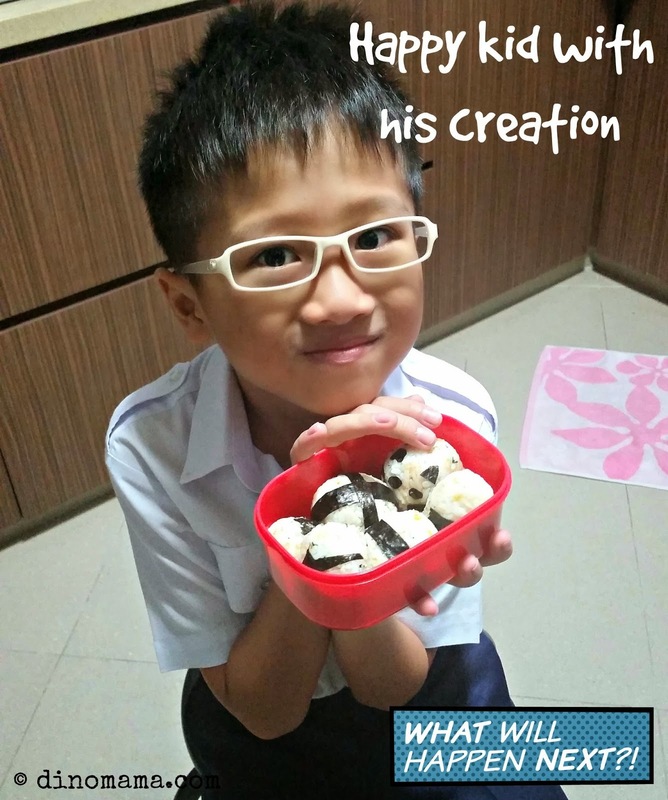 He came home with an empty lunch box, according to him (and verified by his best friend) he finished all 6 onigiri during recess time! Too hungry or too delicious to stop? In any way, I am glad that our first bento is a success and he's loving it. My 2 palm sized onigiri may not look a lot to fill a stomach but surprisingly they did! I wasn't stuffed full but just full, comfortably full and I did not feel any hunger till after 5pm, by then dinner is another hour away. No wonder those Japanese ladies are so slim and pretty! Wow! Impressive! So creative! Everyday I think what to prepare and how to prepare and end up same ole thing! I should try this. 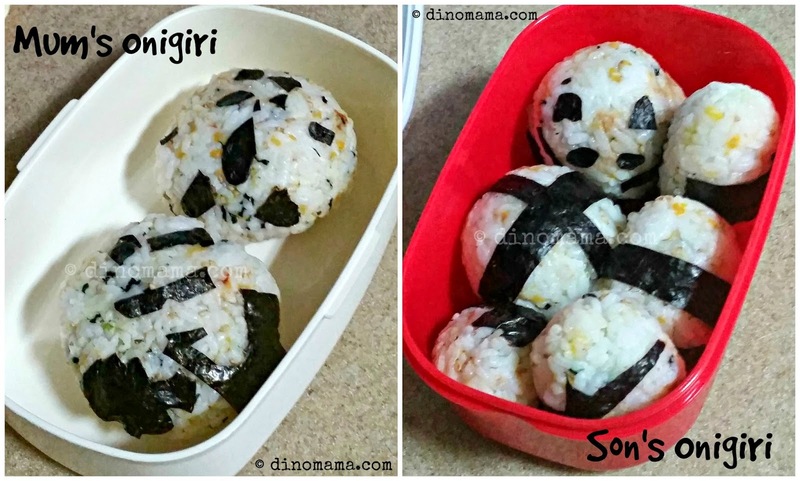 Creative is DinoBoy, I only cook the rice and prepare the necessary things to compliment the onigiri. Sometimes simple things can be tasty too, try it.